Some of the most delicious things we ate in Hong Kong were the egg tarts. Each day we were there, we stopped at Kaiser Bakers in Mongkok, just a block from our hotel, for egg tarts & pineapple buns. This was our, probably very unhealthy but exceptionally delicious, daily breakfast. In Hong Kong, there were two kinds of egg tarts to choose from: tarts with shortbread crust & tarts with a puff pastry crust. We both preferred the shortbread crust, which was conveniently much easier to find. We also had one other variation, a coconut flavored egg tart. Still, the original was better. Mr. FGK enjoyed these so much, he suggested I recreate them once we were home. 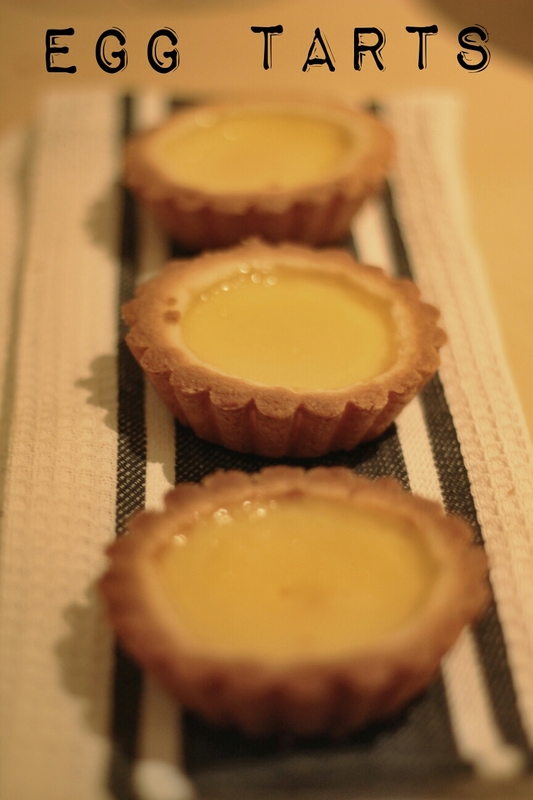 He even guided me to Shanghai Street, also known as Kitchen Street, to buy some mini tart tins for baking them in. By the way, if you love cooking and are ever in HK, Shanghai Street is a must do. I was in heaven exploring all the shops for pretty little kitchen tools at a steal of a price. However, with us being in our teeny-tiny Korean apartment & the hassle of transporting fragile items from HK to Korea and then off to another place in the future, we chose to only snag a few small items. I bought tins for my tarts & a pretty little apothecary style tea pitcher. I was able to use both for this recipe. I was excited to try baking these, but also a bit nervous about how they would turn out. Much to my surprise, they were easy & flawless on the first try. The thing that made them easiest was that I prepared the shortbread days before. I made a big batch of my basic shortbread recipe. I used half of that batch as the basis for my Earl Grey Shortbread Cookie recipe & the rest kept in the fridge for my egg tarts. That, of course, cut my workload in half. Once I had the shortbread soft enough to roll out & shape into the tins, all I needed to do was make the filling & bake. The process for making the filling might seem like a lot, but it really was very easy. First, I made a simple syrup, then added the eggs through a sieve. Once the eggs were incorporated, I added all the other ingredients, then again, poured the filling through a sieve to thin out the egg whites. Then I just had to fill the tarts & bake. Easy peasy, right? Really, the most difficult part, because we’re in Korea, was tracking down evaporated milk. These are great for a sweet breakfast, a snack, or I’ve even seen them served as side dishes. Happy baking! Sit the butter out until it has softened. Cream it in a mixing bowl, then add sugar. Mix until well blended. Add the flour 1 Cup at a time. Ball the dough up & wrap in saran wrap. Allow it to chill for 30 minutes. Preheat the oven to 450°F/230°C. Once the dough has chilled, roll it into 1 1/2 inch balls. Put each ball into a tart tin and press it into the tin to create the crust. The dough may come over the tops some. Just trim this part away. Now to create the filling, place the water & sugar in a saucepan over medium heat. Stir until the sugar has completely dissolved. Remove from heat. The water shouldn’t be too warm. Pour the eggs through a sieve and whisk into the sugar-water. Once the eggs have been incorporated, whisk in the vanilla & evaporated milk. Then pour the mixture through the same sieve into a bowl. 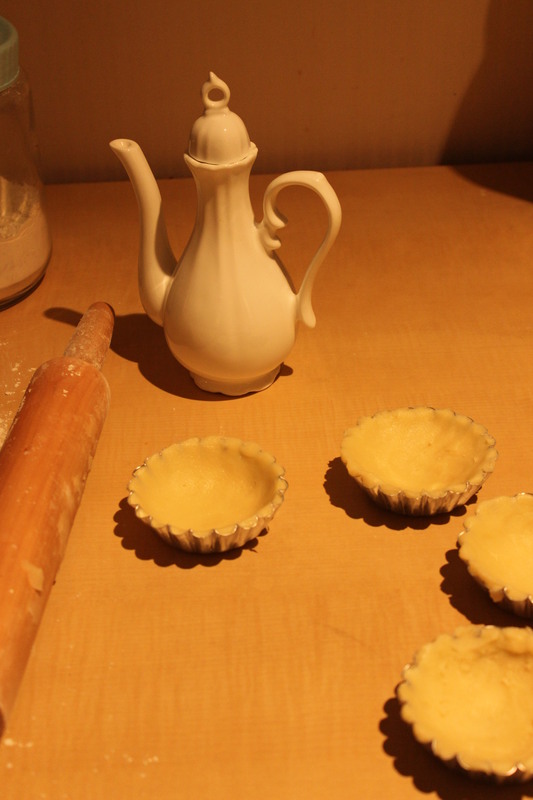 Using a funnel or a pitcher, fill the tarts with the egg mixture. Bake in the oven for 15 minutes. *To check that they are finished baking, place a toothpick in the middle of a tart. If the toothpick stands up, they are finished. Allow the tarts to cool for 10 minutes before removing from the tins. To remove them from the tins, turn the tarts over, one at a time, and lightly tap the tin against a hard surface until the tart slides out. That tea pitcher is beyond adorable, but it must have been a mission to get it home safely! 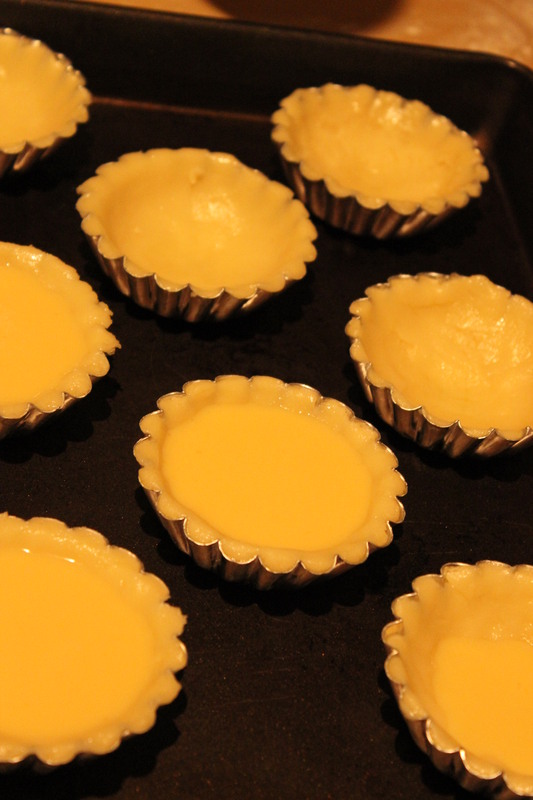 Your egg tarts look delicious! I only ever had the pastry crust, I would have enjoyed shortbread crust a lot more!! Between the bamboo bird cage and tea pitcher, I was so nervous. Luckily we had lots of space under our plane seats so I slid both underneath for our return flight. Looks delicious. I’ll try it. Thank you! I’d love to hear what you think once you do!